Posted on May 19, 2012 by Thannaree C.
“Sawasdee kha! 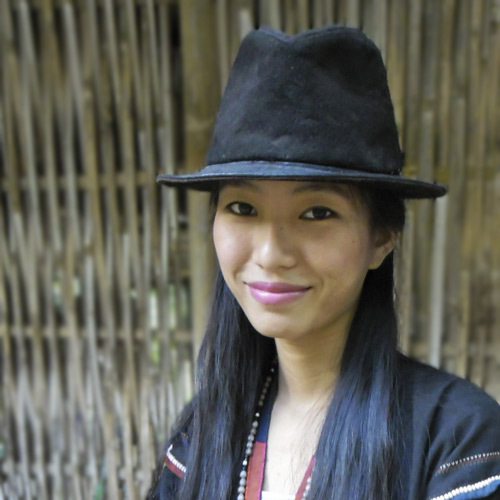 My name is Buesui Arjoh and I am an Akha woman. I was born on the 8th of January 1986 and grew up in a village on the hillsides of northern Thailand. I have five sisters. We were so poor that my four older sisters left the village early to work in other provinces in order to help support our family. They are all married. Presently only my younger sister still lives with my parents. “I helped my parents in the village when I was a child. I would go to the forest with them, gather wood and chop it up into small pieces for firewood. I would then carry it on my back, walking on uneven ground up and down the hills to the other villages, which were located kilometers away. There we would sell all of this wood. During the rainy season I would also help my mother remove the weeds from the rice field. At the time I was 7 years old and thought it was a heavy job, but we had no choice. “My mother is a hardworking, patient and loving woman. Next to the rice field on the hillside, she planted many kinds of vegetables. In the evening, we would pick it up and carry it back to the village. Then the next morning, she would take these vegetables, and other foods my father collected from the forest, to the markets in other villages. At sunset, she would always come back home with little traditional sweets wrapped in banana leaves. These treats always kept us looking forward to seeing her quickly return home. “One day, as my mother was pregnant with one of my sisters, she and my father went out to collect foods and wood. That day they walked deep into the forest. At dusk, while they were trying and find their way out, my mother got lost. In the darkness, she tripped over something and fell flat on a sharp wooden branch. It went right through her stomach. My father finally found her and helped her back home. We did not have enough money to call on the doctor, so my father used herbal medicine to heal her. My sister was born not long after, luckily with no after-effect from this accident, and my mother still has a big scar to remind her of this unfortunate day. “An important event occurred during my childhood. I am not clearly sure whether it was a dream or not, but I vividly remember lying down under the banana trees near the rice fields in the daytime. Suddenly I saw a bright yellow light in the sky. I found myself dressed as a thief with black clothing, with a handkerchief covering my face. I was fully armed. Strange and unknown king and princess approached. I attacked them and took away all of their belongings. “Shortly after that, my ancestors’ spirits visited me. They asked if they could stay with me but I refused and scared them off. Later on I learned that my grandparents used to be shamans. They had the ability to contact all kinds of spirits. They also lead all ceremonies and rituals in the village, including the ritual that consists in sending the spirits of dead people to where they belong. It appears that I have special abilities and that my ancestors wanted me to be a shaman, but I always refused. “Thinking about life in the village, about the hard work we have done and all the stories we have in our family makes me feel happy and proud. In the old days we always worked and ate together, sharing our stories, having a good time. We still do this whenever we have the chance to go back home and be again all together. We still are a very warm family. “It was my father who introduced me to art and creativity. He showed me how to transform a simple piece of shapeless wood into something beautiful using only his carving skills. He would carve tigers, crocodiles, rats, turtles, birds or Devas (angels). It always amazed me how he could create all of these gorgeous figurines with his hands. This awe made me want to follow in his footsteps. So I also began creating with my hands. “I was around 7 years old when I started drawing. I have been passionate about it ever since. I love drawing so much because it helps me present what is in my mind. I am not too good with words. I could only study in the primary level because my parents could not afford more than that. Even during that time, because of the financial difficulties, I did not have much time to attend the school. My friends would then teach me what they had learned at school. But I did not like to study much anyway. Today I have just enough knowledge to read and write. So, being able to express what I mean by drawing is such a great skill to me. “As I grew up I worked in restaurants, cleaning dishes mostly. I earned some money for myself and was able to send some back home to help support my parents as well. They were getting old and could not do much work at that time. My father still carved though. I would try and sell his wooden figurines for him as well. 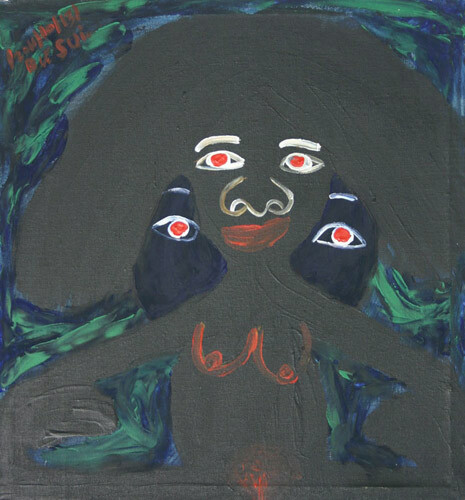 “When I was in my twenties, I had the chance to study art and colors with teacher Sayarm Puengudom. I never studied colors or painting before. When I drew, I just used whatever material I found: clay, wood ash, charcoal etc. So I learned a bit more about colors and paints, and realized that I had certain ability with it, which made me focus more on painting. 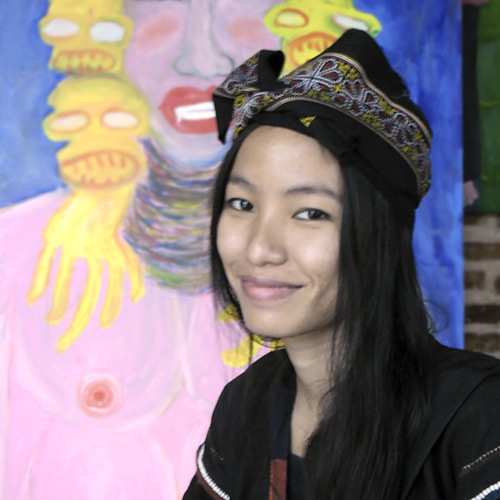 “As an Akha woman from Thailand, I have my ethnic beliefs and traditional ways of life. But I also have my Thai culture and have also been influenced by the modern world. I want to paint what I am, what I feel and what I have witnessed in life. In many instances, what I paint is a very good reflection of who I am. I paint good things but also things that sometimes depress me. “I have seen many good people struggling so hard for their rights, struggling to earn a living and even just to survive. So many times they struggled for nothing. I have seen big people being so selfish, taking advantage of the little people. I have seen many people and things that are not what they appear to be. I have seen too many things in life that should not have happened but did happen anyway, whether right or wrong. I have seen so much injustice. These are things that depress me. 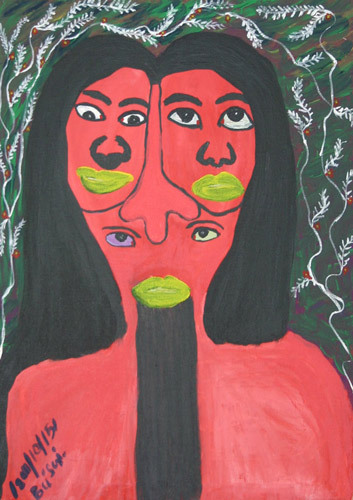 “So my painting mainly focuses on these 2 elements. The first element relates to my Akha ethnic background, which involves our traditional way of life, our culture and beliefs. The second element relates to human’s desires and to the life I have witnessed. “When I paint I need my own space. I need to be alone, quiet and concentrated on what I want to paint. Whenever I paint, it is like I hear someone whispering to me. I hear these voices I do not really know, but they lead and inspire me to paint what I paint. It seems to me that the beings I paint are standing in front of me. It seems that the stories I want to tell are taking place so clearly right in front of me. “I usually do not draw prior painting and just use the colors directly. Some of my paintings might be difficult to understand or even to explain, because I just paint by imagination, by spiritual suggestion and by feelings. Sometimes, however difficult it could be to represent what is on my mind, I paint it anyway. The colors I like to use are strong and with different contrasts. Sometimes I draw before or after painting. When I draw before I do not cover the drawing strokes, as they are part of what I feel. They combine with the colors. Images by Buesui Arjoh © Buesui Arjoh – All Rights Reserved.